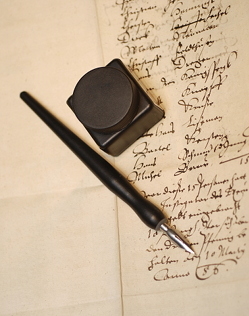 Do you ever wish you could stumble upon a diary that your ancestor wrote or a letter that mentions your family? Our ancestors lived in communities where they interacted with people such as clergy, midwives, storeowners and teachers. At the very least, they interacted with neighbors and friends. Any of these people might have written letters or left behind a journal. You may be surprised to find that your ancestor either left behind documents or is mentioned by a contemporary. Letters and diaries are just a few of the examples that can be part of a manuscript collection. "Manuscript" is often the word used when talking about what an author hands into their publisher that eventually becomes a published book. Similarly, when a repository refers to manuscripts or manuscript collections, they are referring to unpublished documents or a collection of documents. Manuscripts are more than diaries and letters. Other items that fall into this category include autograph albums, birthday books, business documents, ephemera, ledgers, maps, membership records, photograph albums, and scrapbooks. If it is unpublished or a collection of documents, it's a manuscript. Manuscripts may be authored by a government entity or official, a business, a non-profit group, religious organization, society, institution, membership group, an individual, or a family. They may be located in museums, libraries of all kinds, county and state archives, and historical and genealogical societies. Looking for an ancestor in a manuscript collection is different than looking for an ancestor in a genealogy database. With online databases, we are accustomed to searching by name and to that you may choose to narrow a search by a place, date or keyword. However, in searching through a catalog for a manuscript collection, the standard surname search may not help you. Library and archive catalogs are arranged differently than online databases. Consider your local library catalog, which uses subjects, titles, names of authors and keywords to help you find materials. The catalog isn't searchable by every word found in a book or periodical. It's the same with manuscripts. A catalog search most likely won't tell you if your ancestor is mentioned in a particular source. Beyond searching for your ancestor's name in an online catalog (to find those items he did create), you will want to focus on searching by keywords like the places your ancestors lived, the family's religion, schools they attended, membership groups they belonged to, and their occupation. Let's say that your great-great grandfather was mentioned in a journal written by his commanding officer during the Civil War. In order to uncover that information, you need to first search for sources that have to do with that officer, his military unit, and even the battles he fought. Once you identified some sources, you would then need to search through that resource for mentions of your ancestor. Even if your ancestor isn't mentioned by name, you will still have learned a bit more about the world he or she lived in. Once you have identified the keywords to use in searching for your ancestor, you will want to identify potential repositories with collections that might include the types of manuscripts you want. A good start is to identify all libraries, archives, genealogical and historical societies and museums that exist in the area your ancestor resided. Include academic, state, county, city and specialized libraries that have manuscript or special collections. One website that can help you identify libraries is Libcat: A Guide to Library Resource on the Internet. This website is primarily for libraries in the United States, but there are a few international libraries as well. Start with a state and go through each of the categories to identify libraries of interest. Each library name listed is hyperlinked to that library's website. Not sure what other repositories might exist? Try a website like Repositories of Primary Sources or Columbia University's Manuscript and Archive Collections in the United States. Historical and genealogical societies, especially state societies, may also house manuscript collections. Check out the Federation of Genealogical Societies' Society Hall to find addresses and links to societies. Another way to search multiple repositories is by using a union catalog. Union catalogs are more comprehensive than a singular institutional catalog because they combine many library catalogs into one search. This allows you conduct a reasonably exhaustive search easier than searching numerous catalogs individually. One such catalog you will want to start with is WorldCat, which has records of more than 1.5 billion items housed in 10,000 libraries worldwide. The word "library" can be deceiving because we typically equate libraries with just books and periodicals. But the WorldCat catalog includes more than just books; these search results also include things like archival collections, dissertations, and images. You can even narrow your search to include just a certain type of item, like a map or archival material. It used to be that when referring to manuscript collection catalogs NUCMC was the automatic answer to finding a collection. NUCMC, the National Union Catalog of Manuscript Collections is a catalog of manuscript collections in repositories throughout the United States. However ArchiveGrid, once only accessible at repositories is now available in beta for home use. ArchiveGrid is a "primary source" catalog that includes repositories from around the world. ArchiveGrid with its worldwide focus provides you the opportunity to search on collections that may even include your ancestors outside of the United States. Both NUCMC and ArchiveGrid are keyword searchable. Other types of union catalogs also exist. In some cases these catalogs may be strictly for digital collections, which allows you to view and even download images. Some regional union catalogs include the Online Archive of California, Mountain West Digital Library, and Northwest Digital Archives. Now that you have identified repositories that can be of use to your research, utilize their online catalogs and conduct keyword searches to help you find possible collections that may mention your ancestor. Keep in mind that you are looking for collections for the place and time period your ancestor lived. Finding your ancestor in a manuscript collection does take more time and effort. But the information you can glean from those mentions can help fill in the missing details of their everyday lives.